Today in 'so much effort for nothing', world's dumbest thief tried to break into a garage through one of the windows. Except, he missed one key detail - the garage door was open and he could have just walked in. 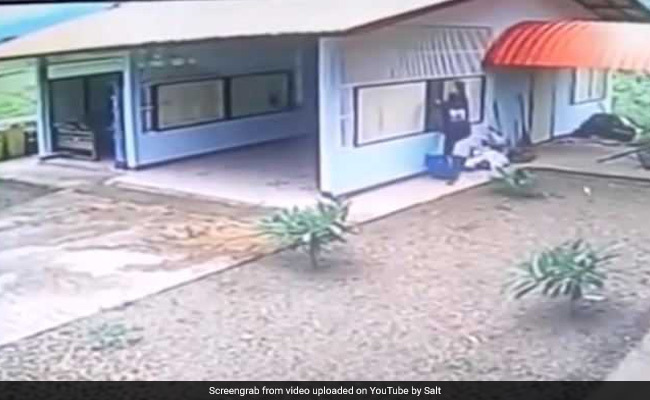 Caught on surveillance camera, the thief, dressed in a hoodie and dark clothes is seen inspecting the property perhaps for an entry point. He tries to open a side door but unsuccessful, he moves on to the window. He then puts all his strength in removing a wooden board covering the window. The clueless burglar finally manages to get in through the window but is unaware that only disappointment awaits him on the other side. A few seconds later, the disappointed thief walks out of the main entry of the garage, perhaps feeling really stupid about what he just did. The thief walks away but not before checking the side door one last time.